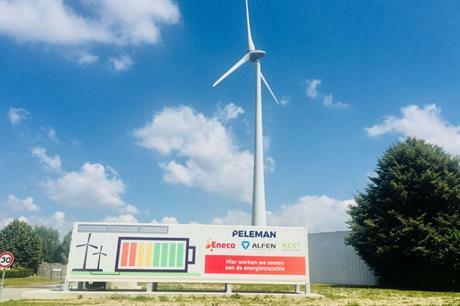 BELGIUM: Printing company Peleman has connected a battery, reported to be the country's largest, to two wind turbines at its manufacturing site in northern Belgium. The 2MW/2MWh battery was provided by energy storage company Alfen and installed by developer Eneco at Peleman’s premises in Puurs, northern Belgium. It is connected to two 2.3MW Enercon turbines installed at the site in 2011. At the opening of the storage solution, Belgian minister for finance, budget and energy, Bart Tommelein, described batteries as "crucial in optimising green power and renewable energy production". He added that energy storage was capable of enhancing the stability of the grid. The battery recharges when production exceeds consumption. It then dispatches power to Peleman’s premises as well as to the Belgian power network. Battery supplier Alfen added this was the first time an energy storage system, installed at a Belgian commercial site, has been used to balance the grid.